Other matters are demanding my attention right now. So this post will have to be lighter than the first dozen. A sorbet, if you will. The challenge is to find food words of only one character. Character needs to have the very specific technical interpretation of assigned code in Unicode 5.0. Word means something that would have an entry in a dictionary. Listing all these words would be hopelessly tedious. So the actual challenge is to find interesting new examples for categories of one character words. In general, one example per script group. The biggest source is the Unified Han characters. So, just by way of a concrete example, take U+98EF 飯 'cooked rice; dish; meal'. Some of the early mostly phonetic scripts still had a few ideograms. For example, Linear B has a handful, such as U+1008E  'wheat'. Unicode has some ranges of symbols, mostly for compatibility with other encoding standards. The closest to a food I can think of from Miscellaneous Symbols is U+2615 ☕, which is meant to be 'coffee' or 'tea', depending on which side of the Atlantic you are on, but might just be 'soup'. Any better suggestions? What about other symbol groups? Is there a better example from the Yijing than U+4DDA ䷚, the open mouth? Some scripts assign code points to syllables. The most obvious example would be Hangul and Korean has many one syllable words. To be concrete, take U+BC25 밥 bab, which again means things like 'cooked rice', as in 비빔밥 bibimbap. (Bibimbap traditionally has meat in it, but Korean restaurants around here offer vegetarian versions; Wikipedia even says that might be the original. Those three syllables also share just the right number of sounds to show off just how elegant the Hangul writing system is.) What about other syllabic scripts, like Ethiopic? Are there any one syllable food words in Ge'ez or Amharic? In general, Unicode does not encode ligatures, since, like fonts, they relate to rendering. But again some result from needing to offer reversible transcoding with other standards. In particular, there are three-letter Arabic ligatures in the U+FD50-FDC7 range. Are any of the ones of those that work in isolation food words? Single letter conjunctions, copulas and prepositions are not hard to find, but what about food nouns? Diacritics are allowed, of course, provided Unicode offers a composed character with them. vdict.com says that é (U+00E9) is a regional word for húng 'basil'. I am disinclined to allow abbreviations. So, I do not think that the L in BLT counts; too much context is required. (Of course, around here it's VLT, which the editorial review for this book says is made with fried leeks.) Nor longer ones like trying to have U+FB00 ﬀ stand for French Fries. Leave a comment with additions or improvements. With luck, I'll have time for a more interesting post next time. KAMUT (kah-moot), the "Great Grandfather of Grains". Derived from the ancient Egyptian word for "Wheat", this high-energy grain was discovered thousands of years ago. Never mind coordination problems in the telling, there are stories of the origin of the food and its name here. Kamut® is a trademark for cultivar QK-77 of Khorasan wheat, owned by the Quinn family and their company. It is also a Protected Plant Variety (8900108), which allows control of seed distribution under any name. As its website admits and the Wikipedia page explains, it does not descend from a few grains preserved for millennia in a sealed tomb, but from some relatively isolated Middle Eastern crops that were introduced to the North American plains around WWII. Einkorn (T. monococcum), a diploid species that was cultivated early on. Emmer (T. dicoccon), a cultivated tetraploid species from Wild Emmer (T. dicoccoides), a wild hybrid of two other diploid species. Durum (T. durum), another tetraploid species from Wild Emmer. Spelt (T. spelta), a hexaploid species, hybridized under cultivation from Emmer or Durum and some wild diploid species. Common wheat (T. aestivum), another hexaploid species. Khorasan wheat is tetraploid like durum and has been variously classified as T. polonicum, T. turgidum, and now T. turanicum. (All these tetraploid species are sometimes considered subspecies of T. turgidum.) Here is a diagram of the genealogy. Looks like it's the Uncle of Grains (on the web, it was "Great-Great Grandfather"). It is also known as Oriental wheat; in Chinese, 杂生小麦 za2 sheng1 xiao3 mai4 'mixed breed wheat'; in Russian, пшеница туранская pshenitsa turanskaia 'Turanian wheat'. According to the article, Khorsan wheat came to the US in 1949 with an Air Force pilot from Montana. It cites a 1964 Great Falls Tribune article claiming that “King Tut's Wheat” was found by a Montana farmboy in a tomb in Dahshur and miraculously germinated. The Gastronomica author finds a Harvard paleobotanist to point out that grain does not last for thousands of years. Of course, this is an old story. For example, on Dec. 8, 1930, Time magazine had an article that mentioned seeds taken from the tomb of Tutankhamen when it was opened in 1922 and sent to Alberta in 1926 and just then (1930) harvested into a few bushels of "King Tut Wheat." And so is the debunking. On Dec. 29, Time ran a letter to the editor that prompted someone to ask the NYBG and get an expected grain lifetime of seven years. I am more curious about the etymology than marketing hyperbole. Older marketing literature claims that it means “Soul of the Earth,” and relatively recent materials for products or from distributors repeat this claim (along with the fanciful timeline). However, the current trademark page comes right out and says that it comes from looking up 'wheat' in Budge's An Egyptian Hieroglyphic Dictionary and shows a scanned image of the dictionary entry. Part of the same scan showing the hieroglyphic headword appears elsewhere on the site. The Gastronomica article adds a couple of parenthetical details: this was the only Egyptology book in the Great Falls public library (actually, it's easy to find out that they don't have a copy of that book and that they do have others that are old enough to have been on the stacks in 1987, so perhaps it's some other library) and Budge's 1920 work is no longer considered reliable. Dover Publications reprints a number of works of obsolete philology, like Budge and Wieger, cheaply (even more cheaply right now while their bestsellers are on sale) because they are out of copyright. Budge is a problem for real Egyptologists; he was behind the times even in his own day and by now they are likely to dismiss him as worthless. But because these editions are so cost effective and so widespread, everyone with any interest in the area will have encountered them. If one gets more serious, there is some unlearning to be done. I got a copy of Gardiner's Egyptian Grammar right away when I got to college, but maintain an affection for the books I had growing up. Moreover, lots of these Dover works can be studied in their own right for a perspective into the late British Empire. In particular, their recent reprint of The Nile, which Budge did for Thomas Cook so that young ladies traveling to Egypt would have an educated companion, is quite entertaining in that way. Composing text in any different script used to be a significant undertaking before Unicode, with custom fonts and encodings. But Unicode support for Egyptian hieroglyphs is still working its way through proposals and committees. So putting them in a blog post means using images. But even that has gotten comparatively painless. There are programs to do the composition and rendering starting with Manuel de Codage format, standalone or within PHP; there is even a site to do it all remotely. +s k-A-m-w-t:t-M2:Z2-! gives and we're in business. kamut , Hh. 457, , , wheat, grain; Heb. קָמַת (? ); , , wheaten bread. The phonetic part is the same; the determinatives are 'plant', 'grains', 'pouring grain', 'cake' (in one of its variants). Hh. stands for Text of Ḥer-ḥetep, Maspero, “Trois Années de Fouilles”, Mémoires de la Mission Archéologique Française au Caire (1884). Unfortunately, this does not seem to have been digitized online yet. When thou comest into the standing corn of thy neighbor, then thou mayest pluck the ears with thine hand; but thou shalt not move a sickle unto thy neighbor's standing corn. A more modern transliteration of is k3mwtt (I am going to follow Allen, but with 3 for aleph, because it renders reasonably in HTML). This word is not in Faulker. But it is online in the Thesaurus Linguae Aegyptiae, which has "Ähre (der Gerste)" and a reference to page 106 of the Wörterbuch der Ägyptischen Sprache, which has "belegt Totb. M.R. ; Königsgr. Bez. für Gerste. auch Bier daraus." In other words, while this could be 'grain' generally, it is 'barley' specifically. It is not certain that Khorasan wheat was grown in a place and time where Egyptian was spoken and probably impossible to know what it was called there if so. קָמַת qamaṯ is from the root קום qwm 'rise'. There is also k3mw 'vineyard' like כֶּרֶם kerem. The BPL has Etymological Dictionary of Egyptian as published so far, but it's a many volume effort that isn't up to that sound yet. Here is a list of Afro-Asiatic cognates including k3mwtt, such as Pero koomo 'maize' and Nzangi kʷǝmǝ 'corn'. Budge has a dozen words indexed under 'wheat'. Presumably Quinn picked the one that sounded best for a trademark or maybe just the last one, closest to the index. It is worth having a look at some of these and some related words nearby in the semantic space. The table gives Budge's definition (plus glosses in brackets) and more modern ones, so it also gives a sense of how accurate the old source is in this quite limited area. ȧt corn, grist; Copt. ⲉⲓⲱⲧ ['barley']. jt barley; corn in general. beṭ-t spelt, millet, dhurra, barley; Copt. ⲃⲱⲧⲉ ['emmer']. su-t wheat, corn, grain; Copt. ⲥⲟⲩⲟ ['corn, wheat']. zwt a kind of emmer. su-t corn, grain, wheat; Copt. ⲥⲟⲩⲟ, ⲥⲟⲩ. qemḥu bread made with fine flour; compare Heb. קֶמַח [qemah 'flour' e.g. Gen. 18:6], Arab. قَمْح [qamh 'wheat'], Syr. ܩܲܡܚܳܐ [qamhā’ 'flour'], Eth. ቀምሕ፡ [qamḥ 'fruit; leguminous plant']. qmḥw a kind of bread. khenṭ wheat; Heb. חִטָּה [ḥiṭṭāh 'wheat' e.g. Deut. 8:8], Targ. חִנְטָא [ḥinətā’], Arab. حِنْطَة [ḥinṭa 'wheat']. ḫnd kind of cereal? millet? This article also seems to mention this, but I don't have access to a copy. 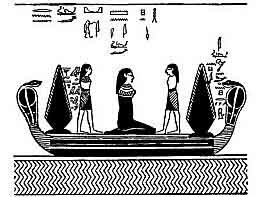 In the Second Hour of the Amduat ( mḏ3t-jmj-dw3t 'Book of Things in the Netherworld'), the sun god's boat travels through a region known at Wernes ( wrnz), where the fourth boat encountered is that of the grain god Neper ( npr), bearing an armless goddess flanked by two armless gods. In the stern of the boat is a giant ear of grain with legends j3t-k3mwtt 'staff of grain' and . The online text of this chapter does not have the hieroglyphic text for that particular section, just Budge's translation "collector of herbs and plants." And the picture is a little hard to make out; the columns in question are between the left-hand ear and the god facing right. Budge's text comes from Lefébure's copy from the tomb of Seti I (KV17). Thanks to the Theban Mapping Project, here is a photo of the original text online. The word kamut written in context three thousand years ago without leaving the breakfast table. Several of the local Indian restaurants regularly feature Mooli Paratha on the specials menu. I do not recall one that has it on the regular menu, but the well established notion of standing specials seems just as good. It makes for a nice break from the more common Aloo (Potato) and Gobi (Cauliflower). A typical menu gloss is, “flaky bread stuffed with radish.” There is nothing wrong with this, but I think a more descriptive version would be “… with daikon.” Daikon is what large white radishes are called in supermarkets, at least here in the Northeast. There is no fundamental basis for this priority that one could predict, it could have gone the other way; just as okra might have ended up being known as bhindi or bamia. I wonder whether it is ever reversed in Britain. I believe mooli is in the OED and daikon is not. The BBC has two essentially identical entries. Has a menu or restaurant review ever referred to “Japanese style mooli”? What about Raj travelers to Japan? As expected, the Wikipedia Daikon entry provides some synonyms for Japanese 大根 daikon, such as Chinese 白蘿蔔 bai2 luo2bo2 and Korean 무 mu. And the M.M.P.N.D. 's Raphanus page has even more, such as Hindi मूली / Urdu مولى mūlī, which got me started, Vietnamese củ cải, Thai หัวผักกาดขาว hŭa-pàk-gàat kăao. Of additional interest is an extended discussion of the taxonomy problems that radish presents. The author "refuse[s] to believe that the true Japanese daikon is the same as the 'Black Spanish winter radish' or the 'Chinese long green radish'" and explores several alternative ways of categorizing. At another end of the debate is the cited Northern Ontario Plant Database entry, which equates pretty much everything. In later works, μῶλυ, like μώλυζα, is a glossed as σκορόδων 'garlic'. Ancient Greek for 'radish' is ῥαφανίς, related to ῥάφανος 'cabbage', whence the generic name Raphanus. This gives Modern Greek ρεπάνι and a few other European 'radish' words like Portuguese rabanete, diminutive of rábano, cruciferous plants in general. Not surprisingly, other Indic languages have the mūla root: Bengali মুলো mulō; Marathi मूलक mūlaka; Nepali मुलो mulo; Punjabi ਮੂਲੀ। mūlī. Dictionaries give Persian تربچه torobcheh; Arabic فجل fujl — Lane quotes one of his source dictionaries are saying it is not a genuine Arabic word; Tibetan ལ་ཕུག་ la-phug — also used to translate मूलक mūlaka in the religious sense that we will get to below. There is nothing wrong with writing Sanskrit in transliteration. The Clay Sanskrit Library, the Sanskrit equivalent of the Loeb Classical Library, publishes the left-hand pages that way. The biggest advantage of Devanagari on the web is that it avoids having to figure out which of many competing transliteration schemes is in use, particularly for single words. Slightly different schemes would also seem to make proofreading source texts harder and I imagine it is already hard enough. Another issue is how much of the sandhi to reverse to facilitate word search. The CSL has a complex scheme that allows for unambiguous recovery of the underlying form. Online documents seem to do similar things, but not always consistently. None of this makes reading that much more difficult. But combined with the rich morphology, it makes searching hard. Even if all the documents are gathered into a single corpus with a consistent format, I assume it is challenging. But things are actually scattered, so something like a conventional search engine is needed, but Sanskrit-aware. Not surprisingly, one can quickly find mention of related projects underway, such as at TDIL and INRIA. I look forward to their bearing fruit and being generally available. This is from a very long litany of negative rebirths depending on what one steals. For some reason, the Sanskrit source given in Platts for मूली mūlī is मूलिका mūlika 'collection of roots'. For example, the 108 roots used at the coronation ceremony for the king of the birds in the Crows and Owls (काकोलूकीयम् kākolūkīyam) chapter of the Panchatantra. This text is online in Wikisource, one of the very few Google hits for मूलिका mūlika. Unfortunately, there seems to have been some corruption in transferring the text, with part missing and a nukta on a ḍa. The Wikisource page was submitted anonymously, so it is hard to trace where it might have come from. The same Platts entry says that मूली mūlī is used metaphorically for something worthless, presumably because it is commonplace food. Ayurvedic dietary principles divide foods into sattvic (सात्त्विक sāttvika 'vigorous'), rajasic (राजसिक rājasika 'passionate') and tamasic (तामसिक tāmasika 'dark'). Radish is considered tamasic; so, like onions and garlic, it is forbidden in a pure sattvic diet, one of the closer traditional analogues to vegan. Though the particular combination of attributes held varies, the radish and the tusk never occur in the same statue / image. Gaṇeśa is almost always portrayed as ekadanta (एकदन्त) 'one toothed'. The stories of how one tusk came to be lost always have it broken off, not pulled out, so there is no accounting for any roots being attached. Sometimes the object clearly does have something sprouting out of the end like roots or leaves and must therefore be a radish. प्रमथाधिपो गजमुखः प्रलंबजठरः कुठारधारी स्यात् . he is one-tusked and carries a radish-bulb with dark blue leaves and roots. But since this verse is only in one version, it may be spurious. If not, it indicates that He holds a radish with something distinguishable at the end. Getty says that the radish is not well known in India, but a favorite in Nepal, Tibet and Japan, suggesting a reinterpretation of the tusk there. Getty's plate 16(d) is a statue from Dhānukā in Bengal with what is clearly a radish. Getty's plate 35 shows a painted image from Endere (from Ancient Khotan vol. 2 pg. 167) with a white radish with green leaves. The esoteric Vināyaka form of Gaṇeśa adopted in Japan carries a radish and is associated with hybrid legend involving a king (named Mararuratsu?) who only ate meat and radishes. Brown says that the radish was actually quite popular in early Indian Gaṇeśa iconography and illustrates (his Fig. 11; another photo here) a seventh century Gaṇeśa from Benisāgar with three leaves pointing downward. He suggests therefore that the evolution might have been in the other direction. Wilkinson (in Brown) translates several Kangyur texts related to Gaṇapati that describe Him holding a radish. Sanford (in Brown) translates part of the Gaṇeśa entry in the Byaku hokkushō (白寶口鈔) of Ryōzen (亮禪) relating to the cannibal king of Marakeira who only ate beef and radishes. Krishan quotes two Buddhist maṇḍalas from the Niṣpannayogāvalī that have Gaṇeśa holding a radish. Daikon is a commonplace foodstuff in Japan, which led to its place in the Zen aesthetic, both as a food and an object. Daikon was a popular subject for Zen ink paintings. An extremely eccentric version is 果蔬涅槃図 Yahai Nehan-zu 'Vegetable Nirvana (image)' by Itō Jakuchū (伊藤若冲) from around 1790. It portrays the paranirvana with vegetables as actors; in particular, a large daikon as the Buddha. An essay “Multiple Commemorations: The Vegetable Nehan of Ito Jakuchu” by Yoshiaki Shimizu in this book discussed this painting. Jakuchū was the head of a fourth generation family greengrocery before becoming an artist full time. But the work still fits within the by then well established concept of 草木成仏 sōmoku jōbutsu 'plant buddha-nature'. This idea is further discussed here in relation to Nō plays and here and here in relation to the work of the poet Saigyō. ruo4 you3 wen2 fa3 zhe3, wu2 yi1 bu4 cheng2 fo2. if there is anyone who hears the dharma, no one will fail to achieve Buddahood. Chūzan argued that 無一 wu2 yi1 did not mean 'no one' as it appears but rather 'one with no [potential to achieve Buddhahood]'. Sōmoku jōbutsu does not really touch on any kind of Pathetic Fallacy, because plants participate in the endless cycle qua plants, such as in their yearly growth and withering. Nor is their suffering the suffering of sentient beings (as might be of concern to readers of a vegetarian blog), but rather the metaphysical suffering of being trapped in this cycle, from which they may or may not be freed by the Buddha. Here is a postmodern appropriation entitled 若冲（野菜涅槃図）Jakuchū (Yahai Nehan-zu) by Yasumasa Morimura (森村泰昌), whose work consists of inserting his own face onto famous works of art, such as Manet or Van Gogh. This is from his 日本美術史 Nihon Bijiyutsushi 'Japanese Art History' series. A Duchampian Buddhist daikon. Finally, I believe it is just one of those language coincidences that a Mouli grater could be used as a Mooli grater to process daikon to make a delicious Indian bread.